These terms and conditions (Terms) form a legally binding agreement between you and us. You acknowledge and agree that these terms and conditions apply to your access to, and use of, our website and materials available through this website. In accessing or using this website or using the materials, you acknowledge that you have read and understood, and agree to be bound by, these terms and conditions. If you do not accept these terms and conditions, then you must refrain from accessing and using this website and using the materials. We, Penington Institute, are the coordinator of “International Overdose Awareness Day”, a global event held on 31 August each year to raise awareness and commemorate those who have been lost to drug overdose. We provide various Materials for individuals and organisations to organise and run their own International Overdose Awareness Day events or activities. You acknowledge that your use of such Materials and resources are subject to these Terms. You can contact us with any questions regarding these Terms by using the “Contact” tab on our Website. You acknowledge and agree that certain Materials offered on the Website are only accessible to registered users of the Website. To become a registered user on the Website, you must register your details with us by providing all information requested including your name, organisation details and email address. 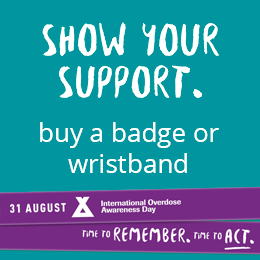 Where you choose to register an activity or event through the Website, you acknowledge and consent to us publishing details of your International Overdose Awareness Day event or other activity on our Website, including, without limitation, the name of the event or activity, your or your organisation’s name and your contact information. You warrant that the information you provide to Penington Institute, whether upon registration or at any other time, will be true, accurate, current and complete. you use the Material entirely at your own risk. Penington Institute reserves the right to withdraw, modify and update any Materials available through the Website, at any time and without having to provide reasons or give prior notice. you agree to link to, or publish the website address of, this Website on your website and other communications (whether electronic or otherwise) relating to each of your events or activities. Subject to your compliance with these Terms, we grant to you a limited, non-exclusive, non-transferable licence to access, download, reproduce, communicate and use the Materials available on the Website or otherwise provided by us in connection with International Overdose Awareness Day solely for the purpose of hosting or running events or activities in connection with International Overdose Awareness Day. Other than for the purposes expressly licensed to you under paragraph 12, you must not modify, copy, distribute, transmit, display, perform, reproduce, publish, license, commercially exploit, create derivative works from, transfer, or sell any content, software, products or services contained within or derived from the Website or Materials without our prior written approval. You may not use the Website, the Materials or any other content provided by us, to further any commercial purpose, including any advertising or advertising revenue generation activity, other than for the purposes expressly licensed to you under paragraph 12. You must only use the Website and Materials for lawful purposes. This Website and Material provided through the Website, or otherwise provided by us, is owned by us or licensed to us and protected under applicable copyright laws. in a manner that disparages us, the third party owners of the trade marks or the Website. The Website may contain links to other websites (Linked Websites). Those links are provided for convenience only and may not remain current or be updated by us. We are not responsible for the content or privacy policies or practices of persons or companies associated with Linked Websites. We will not be liable to you, or any other person, for any Loss arising in respect of use or access to Linked Websites. When you access any Linked Websites you do so entirely at your own risk. Linked Websites should not be construed as an endorsement, approval or recommendation by us or the owners or operators of those Linked Websites, or of any information, graphics, materials, products or services referred to or contained on those Linked Websites, unless and to the extent expressly stipulated to the contrary. The Website is provided to you strictly on an “as is” and “as available” basis. You must take your own precautions to ensure that the process which you employ for accessing the Website does not expose you to the risk of viruses, malicious code or other forms of interference emanating from the Website, which may damage the systems on your device. We do not warrant that your access to the Website will be free from interruptions, errors or viruses. For the avoidance of doubt, we are not liable to you, or any other person, and do not accept responsibility for, any Loss suffered as a result of interference with or damage to the systems on your device which arises in connection with your use of the Website. any decision or action taken by you in reliance on information on this Website, any Materials or any Linked Websites. Any content you upload to the Website will be considered non-confidential. You shall retain all ownership rights in the content but you grant to Penington Institute (and its successors, licensees and assigns) a perpetual, royalty-free, non-exclusive licence to use the content on the Website including, without limitation, storing, copying, reproducing, publishing and making the content available to third parties. “Material” means all material and resources made available either through the Website or otherwise by Penington Institute in connection with International Overdose Awareness Day and includes, without limitation, text, data, audio, sound, recordings, images, graphics, information, specifications, products or other supporting materials. We reserve the right to amend these Terms from time to time. Amendments will be effective immediately upon notification to you through your last notified contact details or notification on our Website. Your continued use of the Website following such notification will represent an agreement by you to be bound by these Terms as amended.